Denali, Mt. 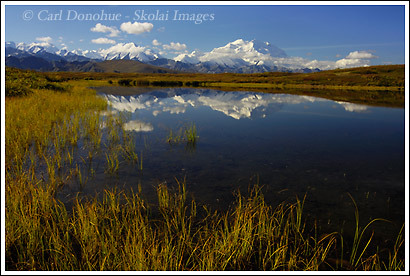 McKinley and reflection, Denali National Park, Alaska. So, here’s an image of Denali I don’t think I’ve posted here before. Mount McKinley is simply one big grand mountain that is ALWAYS a treat to see. I saw it a few days ago. This photo though, was taken last August when I spent a week camped out on the tundra, not far from this pond. Actually, this little pond was my water source. Every morning, after I’d do some shooting, I’d saunter down, ever so casually, fill up my one quart pot, stroll back over to the ‘kitchen’ and make breakfast – oatmeal, a cereal bar and some coffee. I’d inevitably end up drinking too much coffee, because it was so awesome to sit back and stare at the mountain, as folks refer to Denali. You can see the coffee hit the spot in this post. This entry was posted in Adventures, Alaska, Backpacking and Hiking, Cool stories, Denali National Park, Fall, Landscapes, Travel on April 3, 2008 by Carl D.
I can’t imagine it could be any more beautiful!!! What a wonderful image,along with the rest. Great site you have here, with great work,keep it up! Thanks for responding to my “do you blog” post on Naturescapes, I’ve gone ahead an added you to my blogroll. Thanks for dropping by, and the kind words. I’ll check out your site and add you to the blogroll when I get some internet time. Thanks for the note, as always.